This map shows the transmit coverage of the '76 repeater. - Red areas are likely to provide good HT coverage - even with a rubber duck antenna. - Green and Cyan areas should be easily accessible using mobile or home stations with modest outdoor antennas. 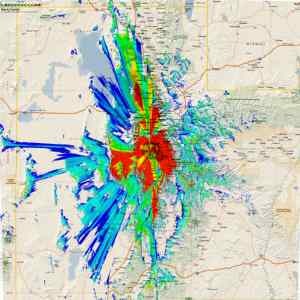 - In Light Blue and Dark Blue areas coverage will be spotty and require a good outside mobile or home antenna - even a beam..
UARC's EchoIRLP Node is online and available for use! While anyone may "Dial In" to this node, only UARC members will be given the "prefix code" that will allow them to "Dial Out" into the IRLP or Echolink network. If you are a UARC member and do not have the access code, it may be found in the printed edition of the UARC Microvolt on the inside front cover, or you may ask a member of the UARC Board. If you are an out-of-town guest or not a member of UARC, you are welcome to use the node on an occasional basis with the assistance of a UARC member. This node operates on UARC's 146.76 repeater on Lake Mountain, west of Orem, Utah. From this site, this repeater covers Utah County, most of Salt Lake County, Cedar Valley, southern portions of Tooele valley, and up into parts of Weber and Davis Counties. For the procedure for using this node, go to the UARC IRLP Node User's Guide page. There is also the UARC IRLP/Echolink Node Quick Reference - a one-page sheet showing the necessary commands - in both HTML (web page) and PDF format (best for printing). If you wish to talk to someone over IRLP/Echolink (or any other Internet connection) wait one second after keying up before you say your first word: If you don't wait, this first word or two will be cut off. Speak up - they can't hear you! If you listen for a short time, you will notice that a lot of people seem to be afraid of their microphone - seeming to want to maintain a "safe" distance from it. Microphones and HT's are designed such that the user's mouth is only an inch or two away from them! If the repeater is linked to another node via IRLP or Echolink, you'll either hear the IRLP/Echolink Internet traffic, or you will occasionally hear "IRLP" sent in CW if there hasn't been any traffic for a while. At the end of Internet-originated transmissions (from IRLP or Echolink) you will hear a "di-dit" as a courtesy beep. (This is an "I" for "Internet" in Morse, in case you didn't know...) ONLY those listening locally to the UARC's '76 Lake Mountain repeater will hear this and not anyone on the other end of the IRLP/Echolink connection! At the present time, BOTH the Salt Lake and Provo Autopatches are offline! Note that the Salt Lake autopatch on the 449.1 repeater is still active. The control codes for the IRLP/Echolink node are available to UARC members only. Note that these codes are only needed if you wish to "dial out" to another location. If you are awaiting someone to "dial in" to you from an "outside" node, no control codes are needed. Other than listening to the repeater for IRLP/Echolink-originated traffic or "IRLP" being sent in CW, there is no obvious way to determine if the node is active: Please be aware of this when calling locals. If you wish to have a "local" conversation, please be aware that you may be being heard by a lot of people across the globe! There may be bugs: If you notice something happen that doesn't work as you expect it to, feel free to send an email, describing what happens, to the address at the bottom of this page. About IRLP: For more information about IRLP in general, go to the Official Home of the Internet Radio Linking Project page. For additional information, also refer to the IRLP Wikipedia page. About Echolink: For more information about Echolink, go to the Official Echolink Page. For additional information, also refer to the Echolink Wikipedia page. Info about all nodes: The Node Information page has links to determine the location and status of other nodes throughout the world. Q: What frequency is this node on? A: This node is on the Lake Mountain repeater on 146.760 MHz (negative offset.) This repeater has just Carrier Operated Squelch (COS) - that is, it requires no subaudible tone for access. Q: Doesn't this repeater have autopatch(es) as well? How can you use the patches and IRLP? A: This repeater has the capability for autopatches - available to club members only - that will share the system. Special control logic has been implemented that will prevent both the autopatch and IRLP/Echolink system from ever being active at the same moment. Please note that at this moment no autopatches are online. Q: Why does it keep saying that the node is busy when I try to connect? A: IRLP and EchoLink detect if the repeater was in use at the moment a connection was attempted and if so, it will return a "Busy" message - this being done to prevent an interruption to an ongoing QSO. If this happens, wait a moment and try again. Echolink will allow multiple connections but may still give a "busy" message if the connection attempt was made at the same time someone was using the repeater. If this happens, wait a moment and try again. If the number of EchoLink connections is already at maximum, you will get a "busy" message. Remember that the number of used/available Echolink connections shows up on the Echolink program (such as that run on a PC) in brackets, just after the location information. For example, if a "[2/5]" shows up after the node information, 2 of a possible 5 connections are currently in use. Q: When I try to connect to a node I get an error message. What did I do wrong? "Node nnnn is busy..." - That means that someone was talking on the repeater associated with the node to which you were trying to connect. Try again in a few minutes. This message may be slightly different for Echolink. For IRLP, you can see if that other node is busy by going to the IRLP Node Status Page to see when it is free - or, if that other node is connected to a reflector, possibly connect to the same reflector. For Echolink, you can go to the Echolink Node List, find the node and determine its status. "Connection timed out..." - This sometimes happens for no particular reason - but it usually means that the node to which you tried to connect is offline for some reason, or it could be due to a temporary network problem at the far end. This message may be slightly different for Echolink. "An error has occurred..." - This is a catch-all error message and it usually means that there is something wrong with the node to which you tried to connect - usually a configuration error, but it could, in some cases, be a temporary network problem at the far end. This message may be slightly different for Echolink. Q: How do I connect to an Echolink node with a callsign/name instead of a number? Go to the sponsoring organization's web site. Chances are, they'll have the node number listed on the same page as the other information about that conference. Go to the Echolink Status Page for a list of all online conferences, links and users listed in alphabetical order. On this list, the far-right column has the node number. Q: Can I connect to both IRLP and Echolink at the same time? A: NO - you can connect to either an IRLP Node/Reflector OR an Echolink Node/Conference, but not both at the same time. There do exist a number if IRLP-Echolink bridges where both IRLP and Echolink users may connect to the same place - the Western Reflector has that capability on several of its ports. Q: Can multiple stations connect to the node? A: The EchoLink portion will allow multiple incoming connections allowing all parties to talk to each other as if they were on a repeater. Note that one can make an outgoing call from the repeater only if NEITHER Echolink or IRLP are already connected: In other words, once a connection has been established, you can't "dial out" to another node from the repeater. The number of used/available Echolink connections shows up on the Echolink program (such as that run on a PC) in brackets, just after the location information. For example, if a "[2/5]" shows up after the node information, 2 of a possible 5 connections are currently in use. Note: IRLP does not allow multiple people to connect to a node, but a similar function is provided with IRLP reflectors. Q: Who can use the node? Q: What about just the repeater, then? Can I use it if I'm not a member? A: It is OK to use the repeater (minus the autopatches and IRLP node) even if you are not a UARC member: The patches and node are considered to be perks of membership. Again, if you plan to use the repeater a lot, it seems only fair that you help support it and join UARC! Q: Can I "link into" the node? A: It all depends on what you mean be "linking into" the node. If you simply wish to use the node, you are fine: UARC members (and occasional guests) are welcome. If, by "linking" you mean set up some sort of crossband repeater to connect to this node, the answer is no!!! If this happens, the node will immediately be turned off to prevent problems to other systems linked to this node. Q: Where can I find the "prefix code" for the node? A: The "prefix code" is only available to UARC members and may be found in the printed edition (not the online version) of UARC's newsletter, the Microvolt on the inside front cover. If you are a member and cannot find this information or do not have access to a copy of a recent Microvolt, feel free to contact a member of the UARC board. Do not give out the prefix code on the air or to non-UARC members. Q: Can I connect to my friend's Wires(tm)/eQSO(or other) node? A: There are several systems available that allow interconnection of radios via the Internet - and IRLP and Echolink are just of them. Note that, in general, these systems do not interconnect with each other and for this reason, an IRLP node cannot be connected to an Echolink node. Having said this, it is worth mentioning that there are several means of providing interconnection - some of which are detailed on the IRLP website on their Other Links page. Q: I just looked up this IRLP node on the Node Status Page for this node and it shows the node as being "Offline" - why is that? A: This is not the normal condition and it may be in this mode for maintenance purposes, or to disable the node in the event that the repeater is being used for a special-events activity and node activity should be suspended. If you wish to use the node and find it set to the "Offline" mode feel free to contact one of the UARC repeater committee members for assistance. Q: I just looked up this Echolink node on the Node Status Page for this node and it shows the node as being "Offline" or missing - why is that? Q: Why did UARC first choose IRLP instead of Echolink/eQSO/Wires, etc.? IRLP was chosen because it is the most secure. IRLP's authentication and security is centrally controlled, closely monitored and based on well proven technology. Some of the other systems rely on the "honor system" in order to prevent unlicensed individuals' access: Usually, the "honor system" works - but not always. IRLP uses the Linux operating system. This operating system is generally more reliable and secure than more common operating systems. When an IRLP system is configured, unneeded ports and processes are turned off or never invoked. Many Linux boxes operate without rebooting for months at a time, needing to do so only for hardware upgrade/replacement. Q: Why was EchoLink eventually added to the node a while after IRLP? When the IRLP node was first put online, we also looked into to adding Echolink as well. At the time, Echolink was fairly new and they were still working out the kinks in determining who was legitimately a licensed amateur and who was not. Since that time, procedures have been improved and there are more volunteers to make sure that people are who they say they are! When the IRLP node was first put online, there were still a few issues with the then-extant "EchoIRLP" software - that is, the software that would allow both Echolink and IRLP to run on the same computer. Since that time, the bugs have been worked out and the implementation is quite stable. Beware 3rd party agreement limitations! Although it may seem strange to some, there are many countries in the world that do not have an agreement with the U.S. that allows 3rd party traffic to be passed. In many cases, it is not legal for you to pass on any message to/from a non-ham as a result of the QSO - whether that person (or persons) is in your shack, available via telephone, or even if you take a message and deliver it later. While something as simple as a "Hello" probably won't get anyone into trouble, anything more than this may start to raise eyebrows. Why is this? In many countries, the radio regulation authority is (or was, in the past) also the same one that is responsible for regulating telephone and the post office - and using amateur radio to pass traffic that could conceivably take business away from these other services is frowned upon. In other cases, some governments simply frown on citizens engaging in anything other than routine amateur-radio communications. While these sorts of regulations are slowly being relaxed, many countries still prohibit such third-party communications and while you may not get into trouble for doing it, the ham on the other end may! For more information on third-party communications, see the ARRL International 3rd Party Traffic page. Occasional audio dropouts: Occasionally, you'll hear stuttering or dropouts of audio. This is not a bug but probably due to lost packets at the other end of the Internet connection. Many users get their IRLP or Echolink Internet connection via Cable, or Wireless modem, and these services that share the "pipe" with many other users: At times of heavy loading these circuits may occasionally drop packets. The UARC IRLP/Echolink connection is made via a dedicated connection to an "Internet Service Provider's Provider" (that is, a company that provides Internet to ISP's) and has only the one subscriber and is thus far more robust than a cable modem or wireless connection in this regard. A known null on the transmit coverage: The '76 repeater has a known problem with transmit coverage along the western portion of the Salt Lake valley. PLEASE NOTE that this problem only affects transmit coverage and not receive coverage, so you may be getting into the repeater better than you think. We are considering several possible solutions to this problem and hope to resolve it in the near future. "IRLP"-specific Morse identifiers: When in IRLP or Echolink mode, you may hear the repeater "ID" more often than before. Some of these IDs are from the radio link: The link ID sounds almost identical to the repeater ID except it doesn't have a "/R" at the end. Note that these IDs or other CW status signals or indicators cannot be heard by those listening over the Internet. Be aware that the repeater may be in IRLP or Echolink mode: Other than listening to the repeater for IRLP-originated traffic or "IRLP" being sent in CW, there is no obvious way to determine if the IRLP node is active: Please be aware of this when calling locals. If you wish to have a "local" conversation, please be aware that you may be being heard by a lot of people across the globe! There are likely to be a few other bugs that show up now and then: Please be patient and let one of UARC's repeater committee members know about it. For the procedure for using this node, go to the UARC IRLP Node User's Guide page. There is also the UARC IRLP Node Quick Reference - a one-page sheet showing the necessary commands. For more info about the W7SP 146.760 repeater, go to the '76 repeater page. If you have any questions to ask about this IRLP node, please click here. Go to the Utah Amateur Radio Club (UARC) repeater page. Go to the Utah Amateur Radio Club (UARC) home page. 3270 - Sinbad System. This node is often tied into this system in South/Eastern Utah. 3574 - Rainbow Canyons ARC, Cedar City, UT. This node can be tied into the Intermountain Intertie. 3925 - Associated with the Bridgerland Amateur Radio Club in Logan. 5620 - This is the WA7GIE system on UHF: It is almost always connected to the Western Reflector. 9070 - The Alaskan Reflector. Various Alaskan nodes are connected here: Often connected to the Western Reflector. 9250 - The Western Reflector. Based out of Las Vegas, many western U.S. and Canadian nodes are connected to this system as well as other across the globe. 9350 - Los Angeles hub reflector. California/Los Angeles nodes often connect here. A "Node" is an IRLP-equipped station: Two nodes may connect to each other, but no-one else can connect to either one. A "Reflector" is like a party line: Several nodes can connect to a reflector and talk with each other.